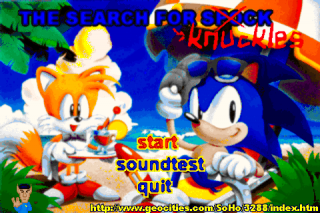 The Search for Knuckles was a really old fan game created in The Games Factory. It is less of a fan game and more of an interactive movie, as the player interacts very little in the whole game. It is quite comical, making many references to famous shows and movies, like Star Trek and Titanic. The plot is that Knuckles has gone missing, and robots are taking over the Floating Island. Sonic must find him before it is too late! This page was last edited on 17 January 2018, at 15:43.